SOMEFLU designs, builds and sells plastic pumps sized. 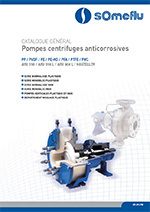 These pumps are used in the most severe industrial conditions. Our line of centrifugal pumps is composed of very thick plastic parts that have been machined from a solid block of material. They can be specifically built using a plastic developed by SOMEFLU, called SOMEDUR®. Pumps are fitted with particularly adapted mechanical seals. This construction makes it possible for us to meet the most varying requirements in the mining industry. Chemical treatments in nickel, gold, copper and phosphate extraction, for example. The recycling of the hydrofluosilicic acid resulting from phosphate treatments. The solidity of our pumps, and their unrivalled abrasion resistance make them reliable, high performance and durable alternative solutions which are often found in mining processes. Don’t hesitate to get in touch with our New Engineering & Project Sales team to discuss your project.